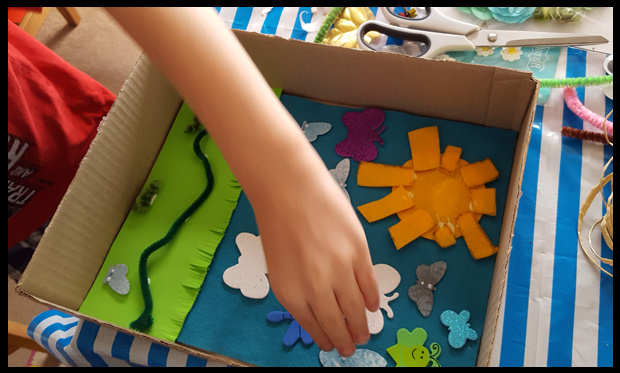 I am so pleased to announce that we are back with the Bostik Bloggers, and our first assignment for July was to create a nature theme with the materials that we were sent from Craft Merrily. As the theme was nature, I took Max out to our local woods to pick up some twigs, as I had planned to put his artwork in a twig frame.... but we went off on a tangent.... as usual. 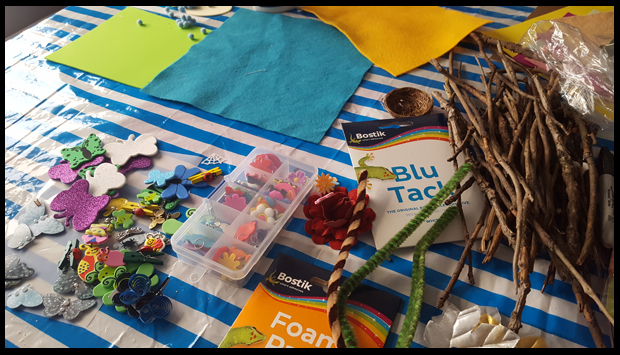 Armed with our twigs, fabulous coloured foam and felt materials and Bostik's Blu-tack & foam pads we were ready to make our butterfly and bug garden. We have a box of craft bits for such an occasion. 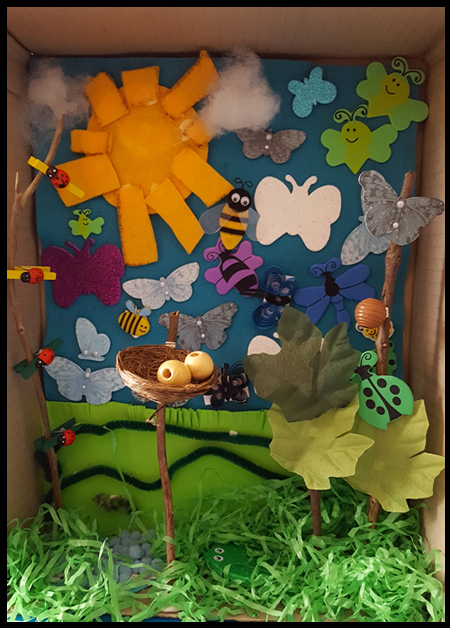 For each visit to Hobbycraft, the Works or brands sending us samples the left overs are stored in my son's craft box and half the fun in creating a new project is rummaging through what we already have, hence our butterfly picture turned into butterfly, bug, frog and forest scene. 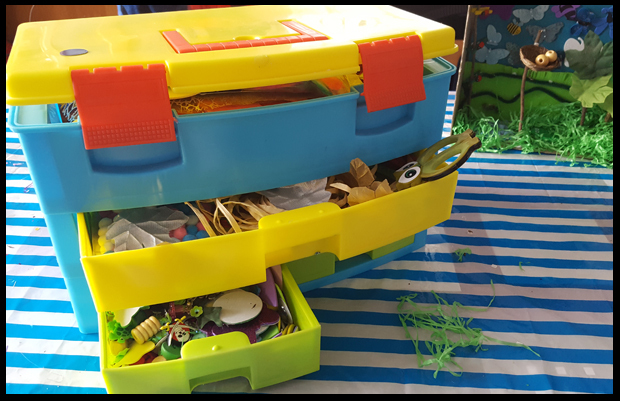 I highly recommend a craft storage box. 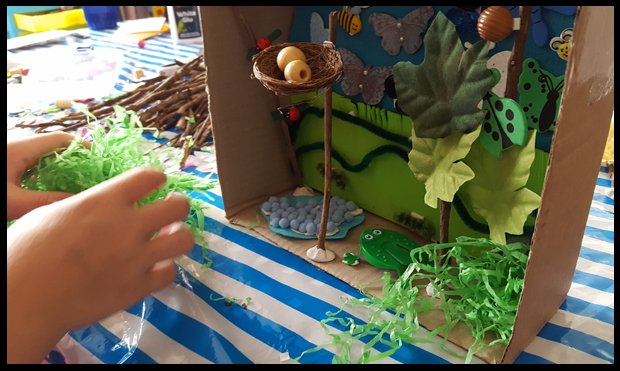 Talking of boxes, my son made his butterfly scene in the box. What a brilliant idea (minimum mess). 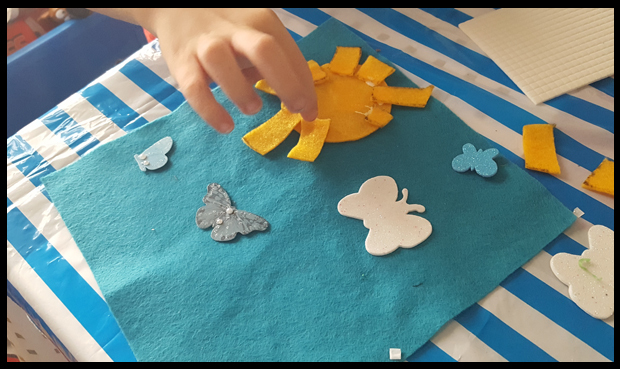 I cut the blue and green felts to size and lets him decorate the blue sky with a sun, bees and butterflies and the green foam with caterpillars. Once completed I used the Bostik foam pads to stick the scenes inside the box and then put the whole thing on its side to begin the 3D effect. He created a pond on the floor complete with a frog and we used the twigs as trees. The decoration on the trees were held in place with the foam pads, which are amazingly sticky and hold firm! The new trees were then held in place using the Blu-tack and covered up with "grass". The whole craft project was rather mess-free if I'm honest. We have various tablecloth covers which I purchase for £1.99 on Amazon, usually add-on items and these last until we've used paint so as this project was a minimum of mess, this cloth's good for an another project and seeing as we're now in the school holidays - I feel that will be very soon. 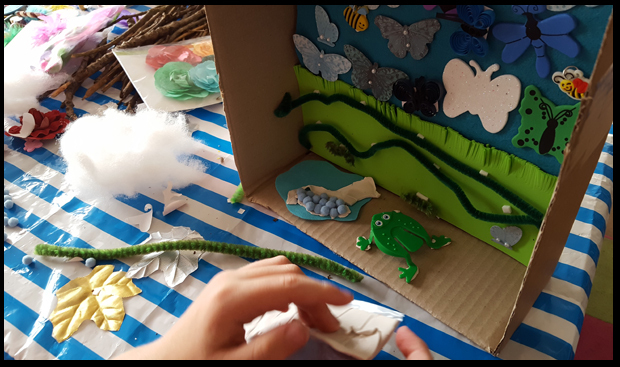 I'm really pleased with his efforts on this project, he's only 5 and started school last September and I do believe it's his interactions at school that has unleashed his creative side.